An Italian Senate committee voted yesterday to block an investigation into accusations of kidnapping against Deputy Prime Minister Matteo Salvini over his decision to hold 150 migrants on board a ship for five days in August last year. The committee voted 16 to six to stop the investigation into Salvini, who is also interior minister and the leader of the hard-right League party which rules in a coalition with the anti-establishment 5-Star Movement (M5S). The case has sown division within the government and in particular within the M5S, which has built its support on pledges to bring transparency to Italian politics and has harshly criticised past parliamentary manoeuvring to halt judicial proceedings against lawmakers. The M5S leader Luigi Di Maio held an online ballot of the movement’s core supporters on Monday, and 59% voted to protect Salvini. The movement’s senators on the Elections and Immunity Committee said that they would honour the online vote. “We have provided the guarantee for this government to keep working,” Mario Michele Giarrusso, a M5S senator who sits on the committee, said after the vote. 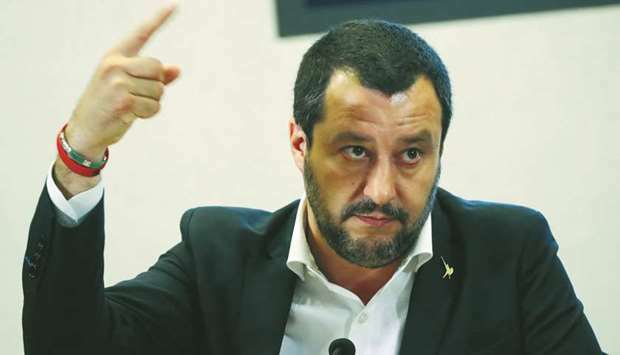 Salvini said that he asked for parliamentary immunity because his decision to block the migrants was in the best interest of the country and was taken together with his allies. Prime Minister Giuseppe Conte and the M5S have backed this position. Some M5S lawmakers have indicated that they want to see the legal probe continue, but the full senate is unlikely to reverse the committee decision because centre-right opposition parties have said that they will vote in favour of the interior minister’s immunity.